September 6, 2016: We are looking for a Unity C# Developer and Node.js/Back-end Developer to join our team. You can find the vacancies here! Hi! I’m Matthias Zarzecki, and I’m making the levels Looking For Group – The Fork Of Truth (among other things). Part 3 – smaller and ancillary tricks that make the entire level come together. 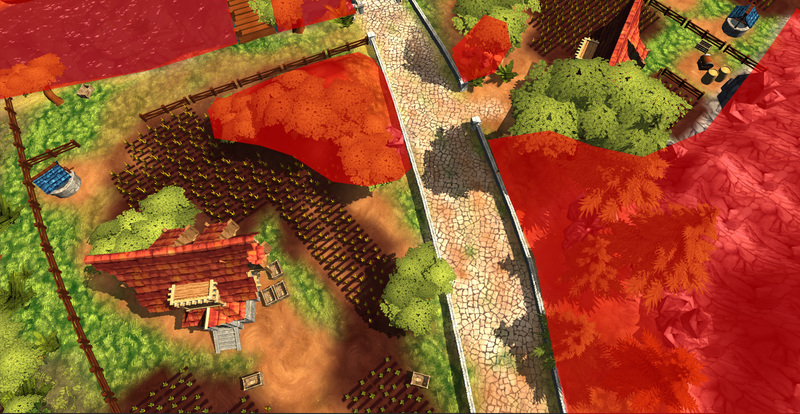 …or our Kickstarter video, you can see the environment the characters fight in. To make these videos, we set out to actually built a playable level. 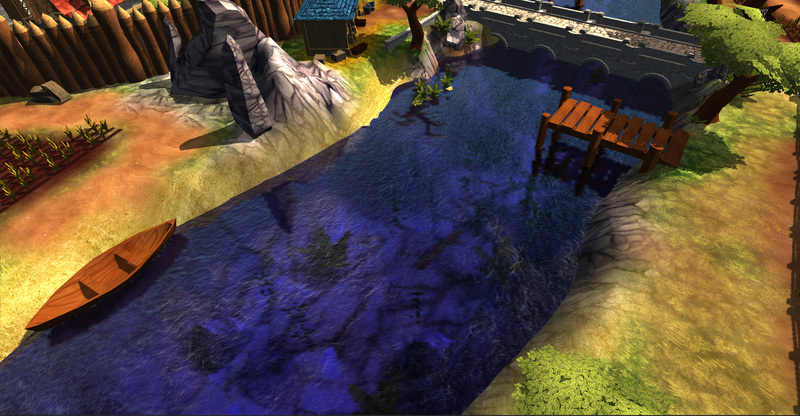 It serves as a prototyping area, to test the combat system and overall look-and-feel of the game. We wanted to use actual footage for the Kickstarter videos, so people would know what to expect. Ultimately this resulted in a fully functional game (albeit a rather short one). The level takes about 10-20 minutes to play through, and is quite fun. So let’s talk about how we made this! 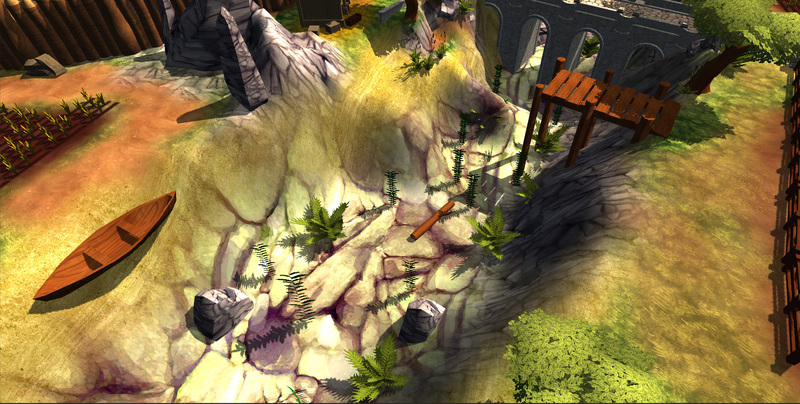 The entire level uses the Unity Terrain. It is a great way to create natural landscapes. 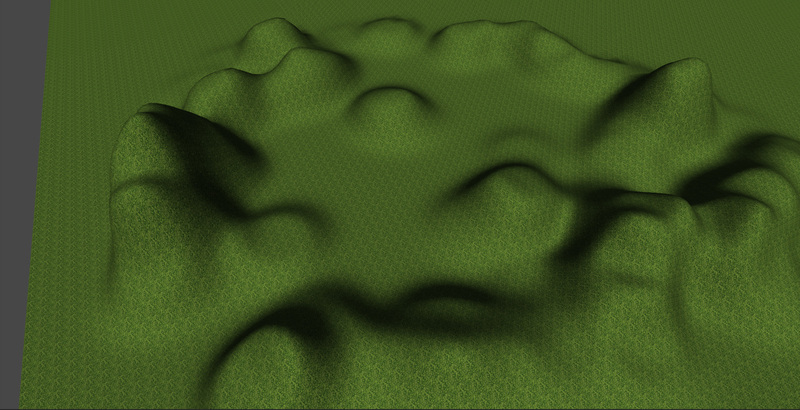 Unity Terrain is an awesome feature, and offers a wide array of options and ways to create a world. You can sculpt almost any kind of landscape with it. Create streets, rivers, canyons – all with a swipe of the mouse. But you have to be careful not to overdo it. 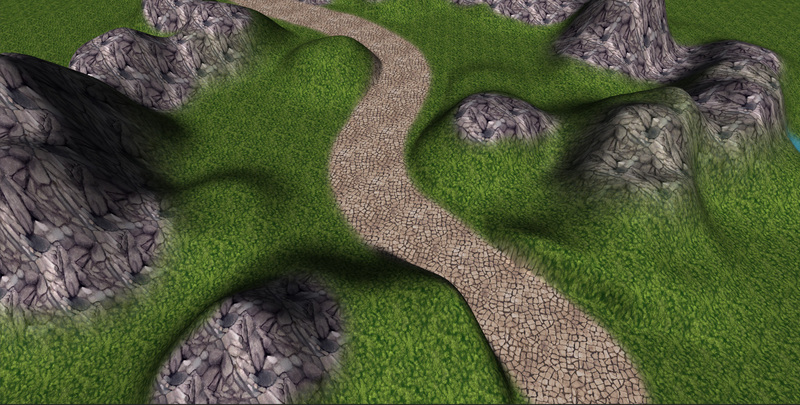 Things may look great, but a hilly terrain could give you all kinds of level design headaches. Height differences make placing things a chore. You might end up spending hours adjusting the vertical position of the objects in the scene, so that they don’t float in the air or are stuck in the ground. Another benefit of keeping your level flat is simpler attacks. Attacks and abilities become much more complicated when there is an uneven terrain. Does a summoned tornado move horizontally, or does it move along with the floor? If so, could it move up a cliff? If you are standing on a hill, does your fireball hit the enemies below or do they fly over? What about if there is a hill between you and the enemy? Keeping the level “flat” gently sidesteps these problems. 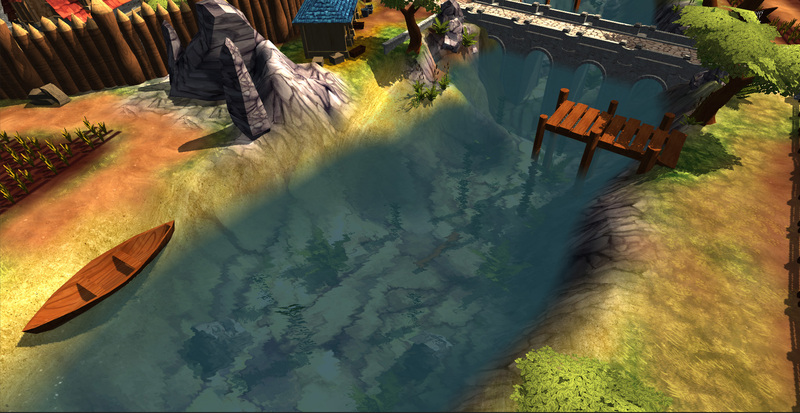 Games like Diablo, Torchlight and Magicka use a mostly planar environment as well. And with good reason. Note that even though we kept the walkable areas flat, we did add uneven ground in some places to give the impression of depth. For the extended game we plan on using height in the levels. 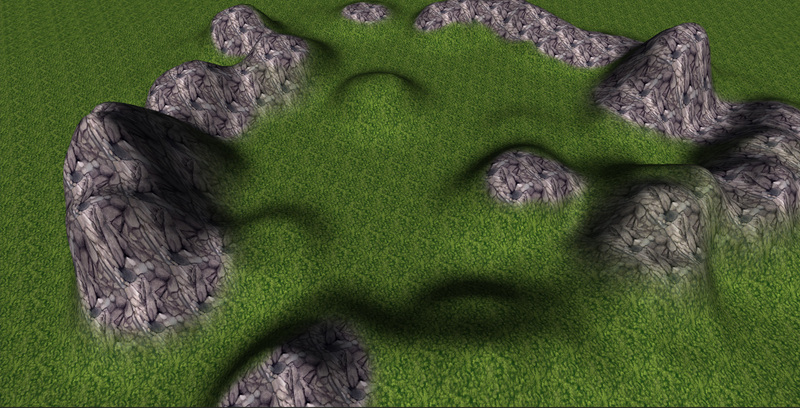 Height-differences and cliffs make for interesting level design, so we don’t want to leave it out for the real thing. The characters can’t interact with water in The Fork Of Truth (yet). Should anything fall into the water anyway, like a goblin thrown by an attack, it is killed immediately. 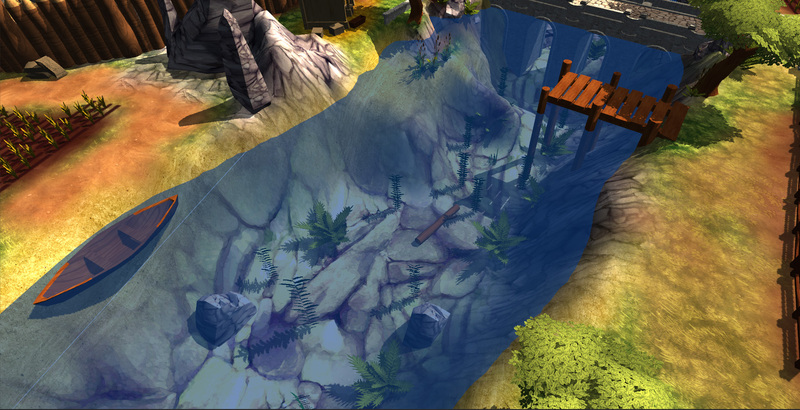 The next one is just about perfect (it is called “Water4” in Unity Pro). 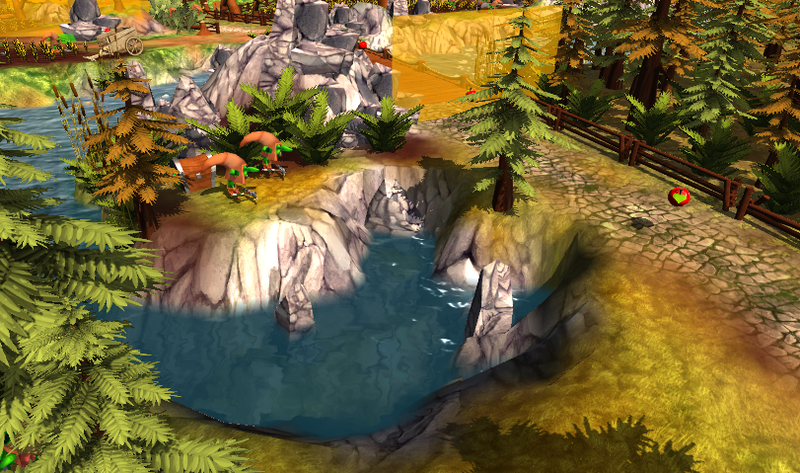 It is transparent, reflects the environment, has animated waves, and nicely fits the cartoony visuals of the game. It also has an interesting “fizzle” area at the borders. Even though it has all of this great stuff, it doesn’t kill the framerate like some of the other advanced water types. Running around in an essentially empty level with just the ground and water beneath your feet can still be satisfying. If that is indeed the case, you have built a solid foundation for the rest of the level. Next time: We’ll have a look at placing the objects in the level, and fill up the environment with trees, bushes, fences, and other doodads. Curious about the The Fork of Truth? We are running a crowdfunding campaign on Kickstarter. Check it out, and if you like what you see, be sure to back the project and spread the word! Thanks for a great insight into the game building process. As someone learning Unity this is truly amazing. I hope for more to follow and wish you the best of luck with the Kickstarter project. Considering making my first Kickstarter support for this project, partly due to your open process. Thanks for the article. I took a few tips about water for my own work. This is still useful in Unity 5, way down the line! Thank you for sharing! 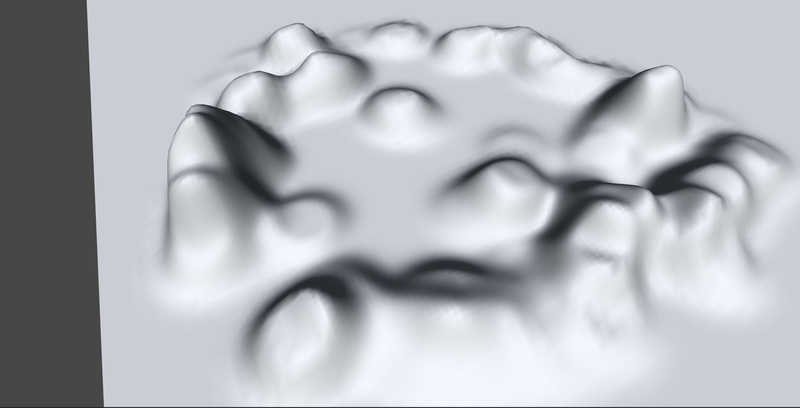 I am trying to implement roads (which you say are easy) but I’m having some difficulty. You say to paint a specific height and then add a texture to the terrain. Is this done programmatically or directly in the editor?